The Auray Fuzzy Windbuster is designed for use with most standard lavalier microphones worn on the outside of the clothing. The Windbuster is an ideal solution in high-wind recording environments. 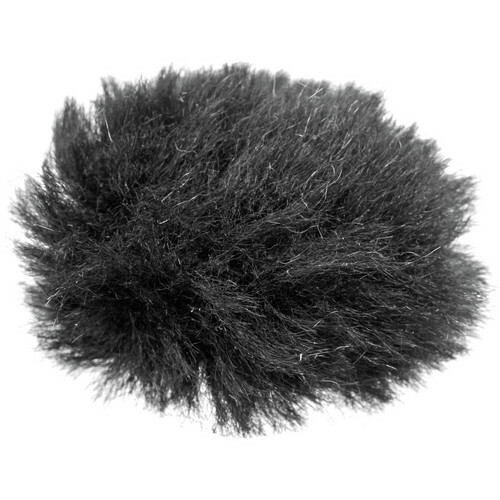 Box Dimensions (LxWxH) 3.4 x 2.375 x 0.5"
Fuzzy Windbuster for Lavalier Microphones (Black) is rated 3.9 out of 5 by 59. Rated 4 out of 5 by Robert B. from Works Good But A Bit Large I really needed one of these because it's very windy here on The Outer Banks Of North Carolina and I do quite a few weddings along with my commercial and other work. This is a destination wedding location and weddings on the beach can be challenging with the wind. The only issues I have with it are that it's kinda hard to put on the mic itself as it's a big ol ball of fur with actual opening and elastic kinda difficult to find in all that fur. Also, it's a bit larger than I thought it was so it's harder to hide it or make it less noticable. The price is a little high for such a simple and small item as well. Overall, I would still recommend this item. Rated 1 out of 5 by Matthew from Ball of elastic string with fuzz WHAT A HUNK OF JUNK! The windscreen seems to be constructed of a wound up ball of elastic string with no opening, and poorly attached fuzz. It requires 3 sets of hands to install on a microphone: 2 hands to pull it open and a third to insert the microphone. NOT IDEAL WHILE WEARING A MIXER BAG AND WIRING UP SOMEONE QUICKLY FOR A LIVE SHOT!!!! OH and they wont fit over the windscreen of a lav as a second layer of wind protection. I use ECM 77s as my mics, and it would be best if I could utilize the ECM 77 metal windscreen and the Fuzzy Windbuster in tandem. For my first one, I just made sure to grab a few hairs in the mic clip to ensure the windscreen didnt fall off. Rated 1 out of 5 by vincethesoundguy from Pretty useless. I bought two of these to replace a Microcat windjammer I had for many years. Yesterday on a job outside on the water I attempted to use both of these to stop wind noise on my 2 Tram lavaliers. First, finding the opening on these things was next to impossible. Yes, they are smaller than my old Microcat but they are so small the entire head of the Tram would not fit into them. And, they did not stop any more wind noise than the foam windscreen that comes with the Tram. I wish some manufacturer would figure out how to make one of these wind screens that will stay on and can be fastened inside clothing well enough so they don't fall off the first time the talent moves. I am very dissatisfied with the quality and performance of these items. If they didn't get so destroyed trying to get the Trams into them and affixed inside the talents clothing I would attempt a return to the manufacturer. My advice - spend the little extra and get the larger other-manufacturer version of these things. Rated 3 out of 5 by Dave from hard to fit small mics I have a very small wireless lav (Sony ECM-88BC) and I bought this windscreen based on recommendations that it fit small mics. You definitely need a small initial windscreen on the mic first and then fit the windjammer over that. Does it block wind? Absolutely. But the fit for small mics will need some adjustment. Rated 5 out of 5 by Video Editor from It works! This little piece of fluff looks worthless, but it has made a big difference in our sound quality. We make videos next to a busy highway with lots of truck traffic that use jake (exhaust) brakes. Before this product, a truck going by would completely overwhelm the camera's microphone, and make the audio narration disappear. Now, a jake brake sounds like a pop-pop-pop in the background - easily 1/4 as loud and easy to ignore. Amazing! Also, windy days used to sound like we were recording inside a tornado. Now it has been practically eliminated. This product is totally worth the asking price. Rated 4 out of 5 by Staplehawk from good in wind or noisy rooms. I personally use my wireless mics in many situations. I've attached them to skaters on halfpipes, Priests during weddings and interviewees at trade shows. This windjammer was the best thing I've used yet to stop the mic from scraping against clothing and to block the wind. I didn't have any trouble at all finding the opening and it slid right on my super small mic. No complaints. Rated 4 out of 5 by Andrew from NO EXCUSE in not having one of these! You need these when you need them, and you will be DARN sorry if you don't have one when the time comes! Used this during a VERY windy wedding and while the pastor's mic was having loads of trouble in the wind (along with the decorations and flowers!) this little guy kept the groom's lavalier mic clear the entire time. Saved my entire video! Buy one and never be sorry. Rated 4 out of 5 by Jim Cerone, Wedding Entertainment Direct from Hard to Find Windscreen But Vital Suggestion for Pearstone... please put Windscreen in your product description. I ordered about a year ago and needed to reorder more - couldn't remember the 'Fuzzy Winbuster' name - took a lot of searching to find these again. ESSENTIAL for outdoor wedding ceremonies. Cuts wind noise and bass rumble COMPLETELY.